Welcome to Everest, an affordable electric gate repair Los Angeles service provider offering custom the highest quality repairs, custom gates, custom garage doors, and a full line of various CCTV driveway gate security cameras for homes and businesses throughout LA. For more than a decade our family-owned business has been providing white-glove gate repair service in Beverly Hills, Brentwood, Malibu, Santa Monica, and a variety of other locations operated by master technicians. Whether your electric gate motor is making a grinding sound, or the gate stops moving when it is half-way closed, you need the best driveway gate repair Los Angeles company to diagnose the problem, and make high-quality fast repairs at an affordable price. Did you know that there are over 100 reasons why your car gate isn’t closing? You could have a damaged track or warn-out wheels. Even the smallest problems can create big catastrophes leaving your home vulnerable to theft and increment weather. Call Everest for high-quality, fast care and a class of customer care that will raise the bar forever! Why Won’t My Driveway Gate Work? Sometimes driveway gates just behave badly and need a tuneup, or full-service repairs may be warranted. Our gate repair service Los Angeles teams are located all over the city to offer fast service when you need it. But before you call us you may be able to resolve a quick-fix on your own by running a manual test. Looking for the Lowest Prices on Gate Repair in LA? Stop Wandering the Wilderness. Everest Moves Mountains for our Customers. We even offer fence gate repairs because we don’t want to exclude any homeowner from getting the help they need to restore peace and order when it comes to something as vital as gate repair Los Angeles help. Each and every one of our team members has gone through extensive training to master all the major manufacturer gate openers, and we arrive with a truck full of parts and new units required to get the job done on the first visit. Whether your gate is a custom monster made of steel, a wrought iron gate, wood gate, or fiberglass gate, our team of specialists will perform expert repairs and offer you the lowest price on driveway gate repairs in Los Angeles! For over a decade, people in LA love working with Everest Gates and Garage Doors not only for our commitment to high quality, but also because we push hard every day to offer the best class of customer care. We love our customers, and are proud to have a perfect rating on Yelp from our incredible customers throughout Los Angeles. Where can I Buy Driveway Gates? You can buy high quality custom driveway gates in Los Angeles at the lowest prices right here from Everest! If you require a popular manufacturer’s driveway gate, we can offer the model at the most affordable prices in LA. If, however, you want a true piece of art hand-crafted by our welding artists, we can create a custom gate that will be the envy of your neighborhood. Add a flare of elegance to your property, and fortify it with solid, built-to-last construction that will serve as a beautiful property feature, and that is built to last for for life. Our craftsmen use only the finest materials and our work is precise and flawless. If you want a driveway gate with your initials in it, or a custom design implemented into the blueprint, our artists can bring your creation to life in beautiful splendor. Everest Garage Doors and Gates strives to change the way in which business is conducted in the standard landscape of electric gate repair and garage door services. Whether you need routine maintenance performed on your driveway gate, or a new custom iron gate to secure access to your home and garage, our Everest crew will demonstrate a class of service above the rest, as our ethics were founded by honesty, integrity and building trust through authentic relationships with our customers. Custom Driveway Gates Built with Integrity and the Highest Artistic Craftsmanship: LA Knows Everest!
. If you discover a mechanical issue, then you need to determine whether or not you have enough training to fix the problem on your own. You can even call Everest Garage Doors and Gates, explain the symptoms, and if you feel capable we can try walking you through some steps to make minor repairs. However, doing any work to an electric gate on your own can backfire. As a consumer you should be made aware that, depending on the gate opener’s manufacturer, any mechanical tinkering by someone who isn’t a certified pro may void the warranty. In addition, if you make a wrong move you can cause further damage requiring costlier repairs. Finally, your fingers will be working with live electrical wires and components. This is why Everest offers the most competitive prices in Los Angeles with a fast response time—we know you want your gate fixed right away in a manner that is safe, cost-efficient, and left in like-new condition ready to make thousands of cycles with no further hiccups. Our friendly, knowledgeable gate repair LA team is standing by ready to take your call, and primed to restore a smile right back onto your face by offering you a class of service that makes us the number one driveway gate company in Los Angeles! Is Garage Door Repair Dangerous? If you want to know how to fix a garage door, you might be in way over your head. 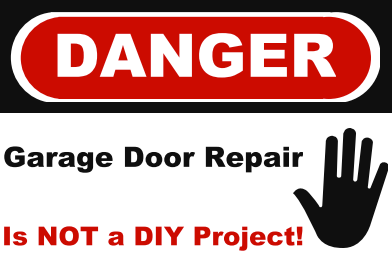 Garage door repair is not a DIY project; it is dangerous and requires technicians who have gone through specific training to get the job done safely and correctly. Every year a death occurs from a homeowner’s attempt to work on his garage door—especially if repairing or replacing springs due to the high levels of torsion. In fact, at Everest we have senior repairmen who hold advanced training who we dispatch specifically to perform garage door spring repair in LA to residential and commercial properties. Don’t risk damage to your property, or to your own personal safety. Call Everest Garage Doors and Gates, and let our skilled team take on your burden for the lowest prices on garage door repair in LA, guaranteed!